The APGRD is a research project based in the Classics Centre at the University of Oxford. It investigates the performance of ancient texts in any medium and any period, from Greek tragedy to Roman epic, from stage to screen, from antiquity to the present day. A world-renowned international research centre, the APGRD has been at the forefront of classical reception studies for over fifteen years and is a pioneer in classical performance reception. For more information visit the About us section, or to learn about our archives and resources visit Research collections. On 22nd March, the APGRD hosted a public reading of Iliad book VI as part of the European Festival of Latin and Greek, based in France. Students and faculty from across the University performed their own original translations at 10am Paris time, in tandem with hundreds of other groups across the globe. The readings were then all broadcast on the Festival's YouTube channel. You can watch the APGRD's contribution below. Participants: Melinda Letts; Olivia Thompson; Nicole Man; Marchella Ward; Lucy Serocold; Felix Clive; Xavier Buxton; Alex Swanson; Emily Clifford; Martina Astrid Rodda; and Rhiannon Easterbrook. 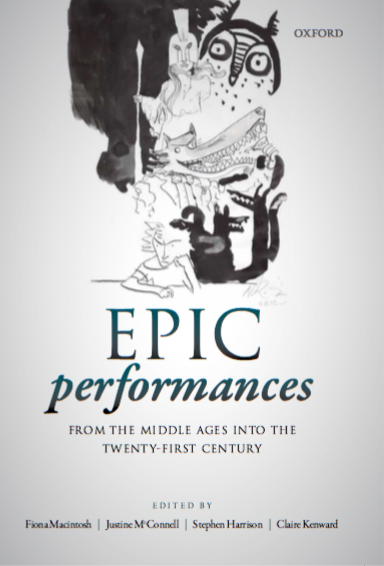 We are delighted to announce the publication of Epic Performances: From the Middle Ages into the Twenty-First Century, edited by Fiona Macintosh, Justine McConnell, Stephen Harrison and Claire Kenward. Find more information about the volume on the Oxford University Press website. The latest edition of the APGRD's newsletter is available to download, containing news from the archive, as well as details of upcoming events and publications. Read it here. Choreographer and dance-artist Marie-Louise Crawley spent six months as Artist in Residence from January to June 2017, as part of the APGRD's Performing Epic project. During her residency, Marie-Louise developed a solo, masked, ancient pantomime-inspired, site-specific dance piece, Likely Terpsichore? (Fragments) for the gallery spaces in the Ashmolean. Based on four female figures from Ovid’s Metamorphoses - Galatea, Myrrha, Philomel and Medusa - Likely Terpsichore? (Fragments) has been performed on numerous occasions in the Museum. A full film version is now available below and on the APGRD YouTube channel. The APGRD have recently launched a new blog, written by our graduates and early career researchers and aimed at sharing some of the stories from the archives with those of you who are not able to come and visit. As well as our 'The Archive in 100 Objects' project, the blog features guests posts by APGRD board members and other researchers, as well as practitioners' views. Read the latest post. T he APGRD received an AHRC Follow-On Funding Award to produce two interactive/multimedia ebooks. The ebooks, on the performance histories of Medea and Agamemnon, draw on our existing published research, considerably enhanced by our photographic, audio and video archival material as well as newly commissioned interviews and performances from scholars and theatre practitioners. The ebooks are free to download and are available either as an iBook for Apple or as an EPUB for all other devices. Visit Medea, a performance history for more information and for links to download the first book. 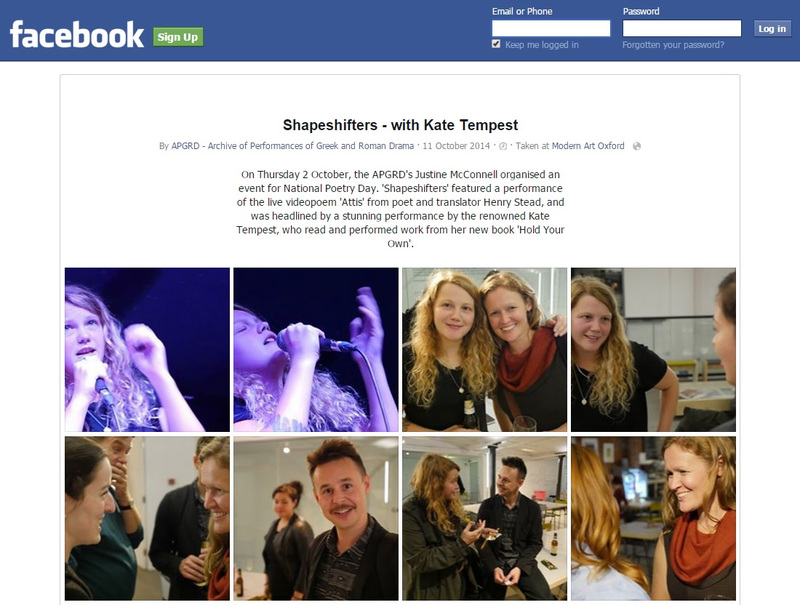 You can now follow the APGRD on Twitter and Facebook for more immediate updates about our events and research, as well as informal and interactive discussions about the performance reception of ancient texts.